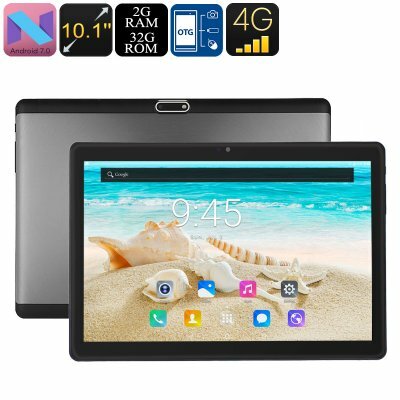 Successfully Added 4G Tablet PC - Android 7.0, Dual-IMEI, 4G Support, Octa-Core CPU, 2GB RAM, 10.1 Inch HD Display, 6000mAh, WiFi, OTG to your Shopping Cart. Enjoy all the latest Android features on a stunning 10.1-Inch HD display with this 4G Android tablet. With its Android 7.0 operating system, it lets you enjoy a smooth user experience while tackling the Apps of your liking. With this Android tablet at your side, you’ll always be able to play games, watch movies, and browse the web. It comes with a 6000mAh battery that brings along up to 4 hours of continuous usage time. Therefore, you can be guaranteed that this Android tablet keeps you entertained throughout the day. With its two SIM card slots and Dual-IMEI numbers, this 4G tablet keeps you connected at all times. You will be able to browse the web anywhere you go at lightning speeds. Naturally, it also supports WiFi through which you can freely use the internet at home or in the office. With 32GB internal storage and a 64GB SD card slot, this Android tablet lets you download plenty of the latest Apps and games from the Play Store. By supporting OTG, it allows you to hook up external hardware devices such as a hard drive or mobile game controller. This will even further increase your overall mobile experience. Its 10.1-Inch display brings forth stunning visuals for you to enjoy throughout the day. Behind its display, your Android tablet PC packs an Octa-Core CPU and 2GB RAM. With this hardware in place, it lets you tackle sophisticated software features without dropping a frame. Whether you use it to write up files, watch movies, or play games – this Android tablet PC is sure to meet your demands. From now on, you’ll always stay connected and entertained throughout the day. This Android 7.0 tablet PC comes with a 12 months warranty, brought to you by the leader in electronic devices as well as wholesale tablets..